Ideal for anyone who wants to listen to music discreetly, and for casual wear during cold days. Never get stuck without your music. Got Ears? Muffones Ear Muff Headphones with Smart Phone Ear Buds Built In! Got Ears? 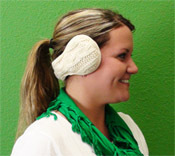 Muffones Ear Muffs with Smart Phone Ear Buds are the perfect solution for winter time outdoor activities. These quality ear muffs feature stylish design, super-soft comfy hypo-allergenic "fur" lining and a set of quality smart phone ear buds built right in. Our specially designed Got Ears? HatPhones allow you to listen to music while wearing a stylish and comfortable hat! Each hat holds an internal pair of slim-profile speakers that rest just over the ears for excellent comfort, fashionable style, and discreet listening. Perfect for cold-weather activities. Great gift!